OZAN KOSE/AFP/Getty ImagesA Saudi official opens the door of the Saudi Arabian consulate in Istanbul on October 8, 2018 in Istanbul during a demonstration for missing journalist Jamal Khashoggi. Surveillance footage CNN published Monday appears to show a man dressed in the Saudi journalist Jamal Khashoggi’s clothes leaving the Saudi Consulate in Istanbul and walking around the city on the day Khashoggi disappeared. The man, identified by Turkish officials as Mustafa al-Madani, apparently wore a fake beard and glasses that made him look more like the journalist. He is one of 15 suspects Turkish investigators have said were dispatched from Saudi Arabia to Istanbul to confront Khashoggi. Saudi agents suspected of orchestrating the journalist Jamal Khashoggi’s death in Istanbul are believed to have stripped Khashoggi and had a body double wear his clothes around the city,CNN reported Monday, citing surveillance footage and an unnamed senior Turkish official. The apparent body double, identified by the official as Mustafa al-Madani, entered the Saudi Consulate in Istanbul without a beard and wearing a white checked shirt a few hours before Khashoggi arrived on October 2, according to CNN. Madani was among the 15 suspects Turkish officials say were dispatched from Saudi Arabia to Istanbul to confront Khashoggi at the consulate. The surveillance footage forms part of Turkey’s investigation into Khashoggi’s death. Turkish President Recep Tayyip Erdogan vowed recently to reveal the “naked truth” about the killing on Tuesday. Hours after Khashoggi entered the consulate, Madani and another man left by the consulate’s back door, the footage reportedly showed. Madani was then apparently wearing Khashoggi’s clothes – a grey shirt and a dark jacket – and had a beard and glasses, CNN reported. Leaving through the back door meant Madani would have gone unnoticed by Khashoggi’s fiancée, who was waiting at the front entrance for at least 11 hours. Reuters on Sunday also reported that Madani dressed in Khashoggi’s clothes to look like the journalist had left the consulate, citing an unnamed senior Saudi official. The surveillance footage appears to show Madani and the other man taking a taxi to Istanbul’s crowded Sultanahmet Square, where CNN said they then disappeared into a bathroom. When they emerged, CNN said, Madani was wearing his own clothes again and clutching a plastic bag, which they then threw away. Turkish officials believe that the bag contained Khashoggi’s clothes, CNN reported. Why use a body double? Chris McGrath/Getty ImagesProtesters outside the Saudi Consulate in Istanbul shortly after Khashoggi’s disappearance. The use of a body double could have supported Riyadh’s initial claims that Khashoggi left the consulate alive. 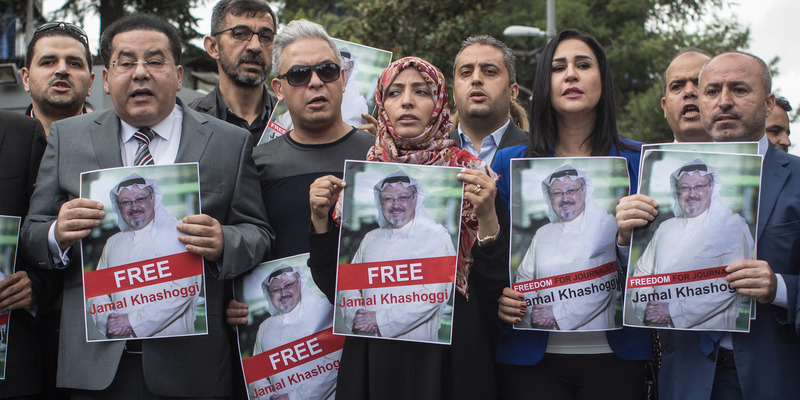 The kingdom has since changed its narrative, however, acknowledging Friday – 17 days after the disappearance – that Khashoggi died inside the consulate. Saudi court officials have attributed the death to a physical confrontation gone wrong, saying Khashoggi died in a chokehold. Saudi Arabia has sought to distance its crown prince and de facto ruler, Mohammed bin Salman, from the killing by blaming the episode on a rogue operation conducted outside the knowledge of top Saudi leadership. On Sunday, Saudi Foreign Minister Adel Al-Jubeir said on Fox News that “even the senior leadership of our intelligence service was not aware” of the operation. But the unnamed Turkish official told CNN that the presence of Madani refuted the Saudis’ claim that they only wanted to interrogate Khashoggi.